Objectives To ascertain compliance rates with the European Commission’s requirement that all trials on the EU Clinical Trials Register (EUCTR) post results to the registry within 12 months of completion (final compliance date 21 December 2016); to identify features associated with non-compliance; to rank sponsors by compliance; and to build a tool for live ongoing audit of compliance. Participants 7274 of 11 531 trials listed as completed on EUCTR and where results could be established as due. Main outcome measure Publication of results on EUCTR. In the US, the FDA Amendments Act 2007 (FDAAA) requires sponsors to post results on to ClinicalTrials.gov itself, rather than be published in a journal, within 12 months of completion for certain categories of trial.6 The two cohort studies published to date on this topic report compliance rates of only one trial in five.910 FDAAA, however, has complexities and limitations. Importantly, not all trials on ClinicalTrials.gov are covered by the requirement to report results on to the register—only those meeting certain criteria; and there is no data field on ClinicalTrials.gov to easily identify the subset of trials required to report results. Furthermore, although a list of trials with certificates of exemption from reporting can be obtained and used as a proxy to help identify those trials not covered by the requirement to report results, in practice many sponsors have only requested these certificates when seeking prospective clarity from the regulator on individual trials where exemption may be contentious; therefore, many exempt trials have no such certification. In addition, the “final rule” that gives further detail on which trials are covered and sets out the process for addressing breaches, was not published until 2016; and the first few trials to be legally covered by this rule have only recently become due to report results.11 In addition, the final rule changed the number of trials covered by the act: trials on unapproved products completing before January 2017 are no longer required to post results after the product is approved. We assessed compliance with the EU requirement to post results on to EUCTR for all trials on the registry, explored factors associated with non-compliance, identified the individual trial sponsors that are best at complying, and created a live online service, driven by regular updates of the EUCTR data, to give ongoing and regularly updated performance statistics for compliance. We downloaded trial records for all trials from the EUCTR database in the week commencing 17 January 2018 using bespoke software produced for OpenTrials.net,16 an open database of publicly accessible documents and data on clinical trials. Fifteen trials were randomly selected, and to ensure the download was correctly accessing data we manually checked variables in the downloaded data against the EUCTR website. The structure of the data on EUCTR is different to that of other registries: each trial can be conducted in multiple countries, and within each trial, each country where the trial is being conducted has a separate register entry; these are linked by a single common trial identity number, with a country code as suffix. Basic information such as trial phase, completion date, and completion status can be discrepant between countries’ entries for the same trial: while discrepancies for some data fields (such as phase) may be errors, others may reflect true differences in the conduct of a trial between countries. For the analysis we collapsed the protocol data for individual countries into a single entry for each trial based on the unique trial identifier (EudraCT Number). We extracted basic information on each trial, including trial identity number, sponsor name, and sponsor class (commercial, non-commercial). We then generated variables for several features of each trial: earliest country “global end of trial date”, latest country global end of trial date, and trial status (“ongoing”; all countries “complete” or “terminated,” some but not all countries “complete” or “terminated,” or other (suspended or no status given)). Based on the presence of a link to results in the results field in EUCTR, we also created a variable for whether a trial has reported results. No other metric of whether results have been reported on EUCTR exists, and all trials that have reported have a link in this field. Our study population was all trials where results were due under the 2012 guideline. Specifically, this included all trials where all countries’ register entries are marked as complete or terminated. We excluded trials where the latest country completion date was more recent than 19 December 2016 to allow 12 months for results reporting, as per the official trial reporting requirements, and 15 additional working days for EMA to publish submitted results. We also excluded trials marked as completed in all countries but where no global date of the end of the trial was given in any country’s record; although these trials should have a completion date, they do not, and so it cannot be ascertained whether their results are due. We also excluded all phase I trials unless they were part of a paediatric investigation plan. We created variables for a range of features of each trial, selected prospectively on the basis of clinical and methodological interest. If there were discrepancies between country protocols for the same trial on any data element, then we coded that trial as discordant between countries for the variable in question. The following variables were generated: phase (I, II, III, IV, or discordant between countries), whether any country has noted the trial as being part of a paediatric investigation plan, whether the condition being studied is designated as a rare disease, whether the trial is a bioequivalence study, whether the participants were healthy volunteers, whether the trial was terminated (specifically, where all countries records were marked as terminated), whether a trial had multiple sponsors, whether a trial was conducted in multiple countries, and whether the sponsor name was missing or unclear. We attempted to generate variables on other features such as blinding, however structured data on these features was spread between multiple fields, which were often incomplete or inconsistent between countries. Sponsor names are entered into the EUCTR as free text, and how the same sponsor is identified often varies, such as GSK Ltd and GlaxoSmithKline Limited, or Medical University Vienna and Medizinische Universität Wien. We therefore manually normalised the data in these fields, merging records under a single name. Separately, where possible, we also created an additional sponsor name variable that accounted for acquisitions and mergers among large companies as well as university hospital systems where warranted. We generated a variable containing the number of trials the sponsor of each trial sponsored, and divided this into quarters. The top fourth of this variable therefore contains trials sponsored by organisations that sponsor a large number of trials, such as large pharmaceutical companies, whereas the bottom fourth contains trials sponsored by those who sponsor very few trials, or only one trial ever. We generated descriptive statistics on both the characteristics of trials in the total EUCTR cohort and the study cohort of trials where results were due. We calculated the percentage of trials reported overall, and broken down by completion year, phase, and sponsor class, whether the trial was part of a paediatric investigation plan, whether the condition studied was designated on the register as a rare disease, and whether the trial was a bioequivalence study or conducted in healthy volunteers. The exact method was used to calculate confidence intervals. We constructed a logistic regression model with all these explanatory variables, as they were selected prospectively on the basis of clinical and methodological interest. The binary response variable in our logistic regression analysis was the presence of results for the trial. Lastly, we produced ranked lists of the sponsors with the largest number of reported and unreported trials. The EUCTR database contained 31 821 trials in total. Overall, 11 345 trials (35.7%) were conducted in more than one country (mean number of countries per trial 2.5, median 1). Three trials were excluded as their final reported completion dates were given incorrectly on EUCTR (completion years 2019 and 2041, both in the future, even though this field is supposed to be retrospectively populated with the actual completion date of the trial; and 2000, before the registry began recording trials), leaving 31 818 trials. We excluded 20 287 trials as their status was not reported as either completed or terminated in all countries. Of the 11 531 trials remaining that were listed as completed or terminated in every country, 3392 (29.4%) were excluded because they had no completion date in any countries’ record. We excluded 540 trials because their completion date was within the past 12 months and results were therefore not yet due, and 325 trials were excluded as they were phase I and not part of a paediatric investigation plan. The final cohort of studies with results due therefore comprised 7274 trials. Figure 1 shows a flow diagram for all trials on EUCTR. Table 1 shows the characteristics of trials in the full EUCTR database and trials in the final cohort with results due. Trial completion dates were evenly spread over the preceding seven years, with fewer trials completing before 2008. Most trials with results due had a commercial sponsor (66.5%). Phase II trials were the most common (44.6%), followed by phase III (32.2%) and phase IV (21.7%). There were few trials on rare diseases (8.0%), bioequivalence (0.1%), or healthy volunteers (9.7%). In the main study cohort of 7274 trials where results were due, 3601 reported results (49.5%, 95% confidence interval 48.4% to 50.7%). Table 2 shows the proportion of trials reported overall at each level of each variable for the cohort of trials with results due. Results were reported for 68.1% of due trials with a commercial sponsor (95% confidence interval 66.7% to 69.4%) and 11.0% of trials with a non-commercial sponsor (9.8% to 12.4%). Trials conducted by sponsors with a large number of trials on the register had a higher proportion reported (18.4% (95% confidence interval 16.7% to 20.2%) for the lowest quarter, increasing to 77.9% (76.1% to 79.6%) for the highest quarter); appendix 1 contains a post hoc sensitivity analysis of reporting rates for this variable in smaller categories. Table 3 shows the crude univariable and adjusted multivariable odds ratios for features potentially associated with trial reporting. In the adjusted multivariable analysis, trials with a commercial sponsor were significantly more likely to post results (adjusted odds ratio 23.3, 95% confidence interval 19.2 to 28.2); as were trials by a sponsor who conducted a large number of trials (18.4, 15.3 to 22.1). We note that odds ratios are often high in studies where the outcome is common. In the crude data, trials completing longer ago were more likely to report results, whereas in the adjusted multivariable analysis this relation was reversed and more recent trials were more likely to report results (per year odds ratio 1.05, 95% confidence interval 1.03 to 1.07). Terminated trials were less likely to report results (odds ratio 0.55, 95% confidence interval 0.45 to 0.66). No statistically significant relation was found between the odds of reporting results and trial phase, use of healthy volunteers, rare disease status, giving no clear sponsor name, having multiple sponsors, or being a bioequivalence study. Appendix 1 contains sensitivity analyses treating “completion year” as a categorical rather than a continuous variable, treating “sponsor’s number of trials” as a continuous variable rather than quarters, and retaining only one randomly selected trial for each sponsor. We found that omissions and inconsistencies were common in EUCTR data, and so we present an additional analysis of these issues. While the date for global end of the trial is expected to be consistent across different country’s register entries for the same trial, 1890 trials (5.9% of the total EUCTR database) had discrepant such dates between countries: the median difference between the earliest and latest completion date among trials with a discrepancy was 48 days (interquartile range 13-133). 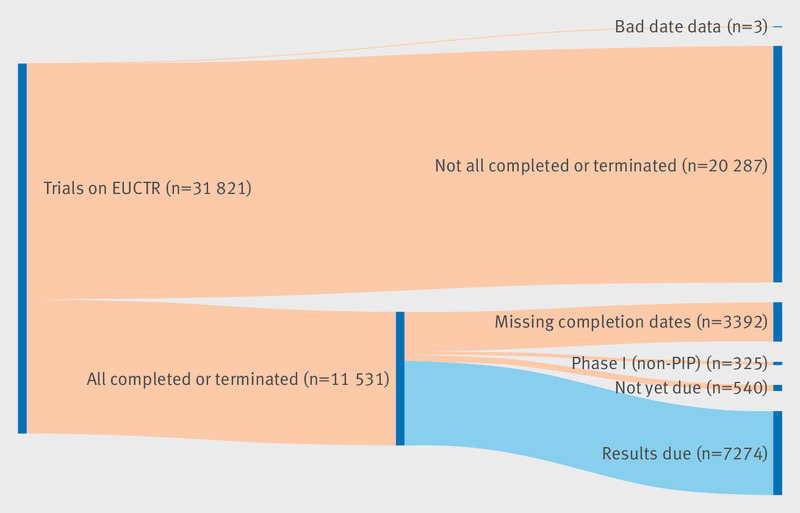 Data for the completion date were commonly missing: in 11 531 trials every country was reported as “completed” or “terminated”—all these trials should also report a completion date; 3392 trials (29.4%) did not. Trials with no completion date could not be included in our analysis as it could not be ascertained whether their results were due. We are, however, able to explore the possible impact of trials with missing completion dates on the overall results reporting rates. Among the 7786 eligible trials that were reported as completed in every country and correctly gave a completion date, 7024 (90.2%) completed more than 12 months ago and therefore had results due, and 722 of the 3270 (22.1%) otherwise eligible trials with missing completion dates, reported results. It is therefore likely that many of the trials with missing dates were due to report results, but failed to do so. We found related inconsistencies for trials with discrepancies on trial status between countries. In the full EUCTR database only some (but not all) countries were marked as completed or terminated for 5754 trials and therefore could not be included in our cohort of trials with results due, as some trial sites may have been genuinely ongoing. However, 4846 of these trials (84.2%) had at least one global end of the trial date, which should only be available when all countries for that trial have completed; this strongly suggests that many of these trials have inconsistent data on the register. It is not possible to ascertain whether these trials have results due; however, 3643 of such trials (63.3%) had reported results. Tables 4 and 5 present ranked lists for major sponsors with the highest and lowest proportion of reported trials. Only sponsors with more than 50 trials in total on the register are included. For these tables we do not attribute trials to sponsors by company acquisition or merger, only by sponsor name (at our online audit tool, trials that may be attributable to a sponsor due to acquisition or merger are listed, but separately). As expected from the crude reporting rates and the results of the multivariable analysis, the sponsors with the highest proportion of trials reported are overwhelmingly pharmaceutical companies, whereas the sponsors with the lowest reporting rates are universities. The live data tool was successfully delivered. Figure 2 shows a screenshot of an arbitrarily selected sponsor’s page, showing sponsor’s summary results, followed by the list of their individual trials, and reporting status for each trial. The data on the site update every month, and all current data can be viewed online (EU.TrialsTracker.net). The names of any new sponsor are manually matched against the existing list of sponsors as appropriate on a monthly basis. Over time—for example, through company acquisition or merger—one current sponsor may become responsible for previous trials from another listed sponsor: this is reflected at the bottom of each sponsors page, where suggested additional sponsors are listed for review by users. Compliance with the European Commission requirement for trial results to be reported to the EU Clinical Trials Register (EUCTR) is poor: only half (49.5%) of 7274 due trials have reported results. Trials with commercial sponsors were substantially more likely to post results, as were trials by a sponsor who conducted a large number of trials. 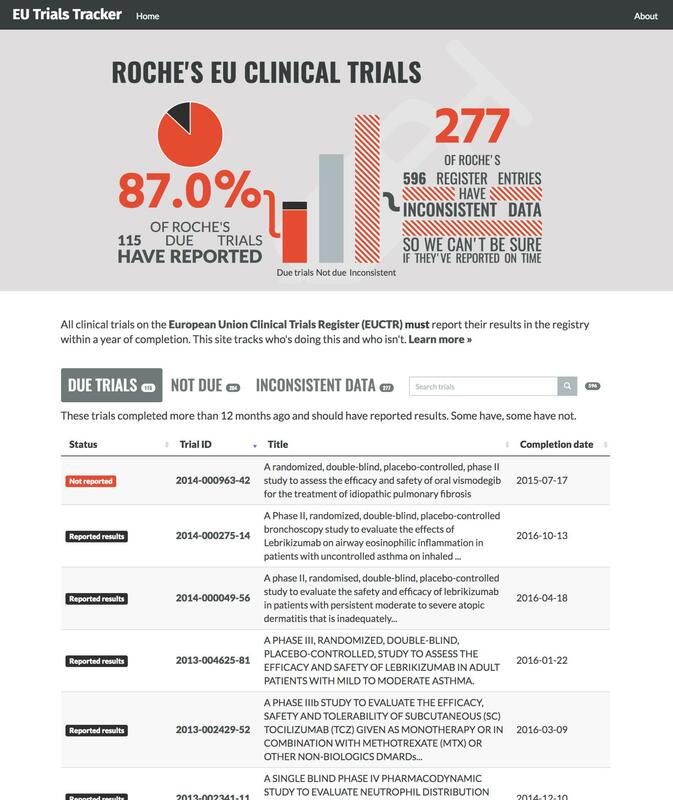 Unexpectedly, we also found extensive evidence of omissions and contradictory data in EUCTR—notably, that 29.4% of trials marked as completed gave no completion date, which prevents ascertainment of compliance with reporting requirements. We also found evidence that completed trials were mislabelled on EUCTR as ongoing in some countries. To our knowledge this is the first study of compliance with European Commission requirements on trials transparency, covering all trials of medicinal products conducted over a 12 year period in a territory of 500 million people, for the second largest trials registry in the world. Compliance rates with reporting requirements can be arguably ascertained more accurately for EUCTR than for ClinicalTrials.gov, as the inclusive nature of European provisions for transparency means that all trials on the EU register are required to report results within 12 months of completion; whereas the FDA Amendments Act 2007 (FDAAA) permits various exemptions from reporting requirements that cannot reliably be extracted automatically across a large volume of past trials from trial metadata on ClinicalTrials.gov. We were able to identify the large cohort of trials where results were definitely due; however, omissions and inconsistencies in EUCTR data presented challenges for assessing compliance with reporting requirements for an additional subset of trials, where it was only possible to ascertain that the data on the register were flawed: 29.4% of trials listed as entirely completed in EUCTR gave no completion date, even though one is required, which made it impossible to assess whether results were due for these trials. Overall, reporting rates were worse in this subset of trials than in the cohort with consistent data; we may therefore have over-estimated compliance. We have found strong evidence that the European Commission guideline, requiring all trials’ results to be reported on EUCTR within 12 months of completion, is commonly being breached. Sponsors doing fewer trials, and non-commercial sponsors such as universities, have particularly low reporting rates: they may be more likely to be unaware of their obligations or lack administrative procedures to flag breaches and support compliance among their researchers. They may also lack clear lines of responsibility: in law, the sponsor is responsible for reporting the trial on to the register; in reality, it falls to the principal investigator or administrative staff. This may be particularly problematic for the smaller cohort of trials newly required (since 2016) to report results on to the register, but that completed in 2005 and have been left unreported; as staff may have moved jobs or even retired. We encourage EU universities to prioritise clarifying these issues for their staff and investing in basic internal audits and administrative work to ensure that results are reported on time. It is possible that enforcement notices or penalties would improve compliance and raise awareness of the obligation to report all trial results: these may become commonplace with the enactment of the new 2014 European Clinical Trials Regulation, which will come into force by 2022. In the absence of formal legal sanctions, public accountability and audit have valuable roles. The presence of a public ranking of sponsors’ reporting performance may encourage organisations to prioritise results reporting in general. In addition, the online resource we have produced also makes it easy for sponsors to identify individual trials from their organisations which have not yet reported results to EUCTR; it therefore offers practical support for sponsors wanting to improve compliance. Although poor reporting rates in some sectors is a source of concern, the extremely high rate of compliance among commercial sponsors conducting a large number of trials is positive: it shows that, with an unambiguous requirement for all trials to report results, near perfect compliance can practically be delivered. In addition, since transparency requirements are relatively new, compliance may improve over time: we will assess this in future research and through routine monthly updates on the accompanying website (EU.TrialsTracker.net). We are concerned by extensive omissions and contradictory data in trial register entries on EUCTR. In some cases these errors were critical and made it impossible to ascertain the compliance status of a trial. If EUCTR is the only source of data to regulators, then it does not contain the information needed for them to establish whether all trials are compliant with European Commission guidelines on transparency. While sponsors are responsible for entering correct data, omissions and inconsistencies could be monitored and addressed by the European Medicines Agency, by running the same checks on its EUCTR database that we have run for this analysis. Typically, publication bias research is retrospective—published long after a cohort of trials have completed—and presents only a single static estimate of overall performance for a population of trials. Static retrospective analyses such as these may not be the most effective use of analytic resources on registry and reporting data, which could be an important source of feedback to improve reporting in individual organisations. Quality improvement work through audit typically aims to identify good performers, learn from their successes, and help those with poor performance to improve. To be effective, audit should give timely, relevant, and actionable data, be repeated, and ideally be ongoing.25 These principles can be readily applied to clinical trials reporting, as we have done in this paper and the associated live data tool online (EU.TrialsTracker.net). From the launch of the associated online tool, using feedback from end users such as policy makers and the research community, we aim to learn how best to implement live feedback on reporting rates and information on individual unreported trials, for maximum usability and positive impact. Compliance with the European Commission guideline, which aims to ensure that all trials report results within 12 months of completion, has been poor. Half of all due trials have not yet reported results. However, sponsors conducting a large number of trials, and pharmaceutical companies, show higher rates of compliance. We hope that accessible and timely information on the compliance status of each individual trial and sponsor will help to improve reporting rates. We thank Open Knowledge International for work on OpenTrials including the initial code used to scrape data from the EU Trials Register, Sarah McNeill for additional discussions on the structure of EUCTR data, Alex Walker for a code review on the Stata script, and Darren Smyth for guidance on European legislation and guidelines. Contributors: BG conceived the project, designed the methods, conducted the analysis, wrote the paper, obtained funding, and supervised the project. FI built the website with input from SB, NJD, and BG. BG and NJD reviewed the legislation, with input from Darren Smyth. NJD extracted and processed the data in SQL, with input from BG, HC, SB, and JF. NJD normalised the sponsor names. BG, CH, NJD, and JF interpreted the findings. All authors contributed to and approved the final manuscript. BG is guarantor. This paper is compliant with the STROBE checklist. The corresponding author attests that all listed authors meet authorship criteria and that no others meeting the criteria have been omitted. Funding: BG is funded by the Laura and John Arnold Foundation to conduct work on research integrity. No specific funding was sought for this project. The funder had no involvement in the study design or the decision to submit. Competing interests: All authors have completed the ICMJE uniform competing interest form (available on request from the corresponding author) and declare: BG has received research funding from the Laura and John Arnold Foundation, the Wellcome Trust, the NHS National Institute for Health Research (NIHR) School of Primary Care, the Health Foundation, NHS England, the NIHR Oxford Biomedical Research Centre, and the World Health Organization; he also receives personal income from speaking and writing for lay audiences on the misuse of science. CH has received grant funding from WHO, the NIHR, and the NIHR School of Primary Care. BG and CH are cofounders of the AllTrials campaign. NJD, SB, and FI are employed on BG’s grant from the Laura and John Arnold Foundation. Data sharing: All data can be viewed at https://github.com/ebmdatalab/euctr-tracker-code. The analytic code and software are shared freely for re-use under an open licence and can be viewed at https://github.com/ebmdatalab/euctr-tracker-data. Transparency: The lead author (BG) affirms that the manuscript is an honest, accurate, and transparent account of the study being reported; that no important aspects of the study have been omitted; and that any discrepancies from the study as planned have been explained.
. Underreporting research is scientific misconduct. JAMA1990;263:1405-8. doi:10.1001/jama.1990.03440100121018.
. Publication bias: the case for an international registry of clinical trials. J Clin Oncol1986;4:1529-41. doi:10.1200/JCO.1986.4.10.1529.
. World Medical Association Declaration of Helsinki: ethical principles for medical research involving human subjects. JAMA2013;310:2191-4. doi:10.1001/jama.2013.281053.
. Rationale for WHO’s new position calling for prompt reporting and public disclosure of interventional clinical trial results. PLoS Med2015;12:e1001819. doi:10.1371/journal.pmed.1001819. European Medicines Agency. Posting of clinical trial summary results in European Clinical Trials Database (EudraCT) to become mandatory for sponsors as of 21 July 2014. 2014. http://www.ema.europa.eu/ema/index.jsp?curl=pages/news_and_events/news/2014/06/news_detail_002127.jsp&mid=WC0b01ac058004d5c1 (accessed 28 Oct 2016).
. Extent of non-publication in cohorts of studies approved by research ethics committees or included in trial registries. PLoS One2014;9:e114023. doi:10.1371/journal.pone.0114023.
. Dissemination and publication of research findings: an updated review of related biases. Health Technol Assess2010;14:ix-xi, 1-193. doi:10.3310/hta14080.
. Compliance with mandatory reporting of clinical trial results on ClinicalTrials. gov: cross sectional study. BMJ2012;344:d7373. doi:10.1136/bmj.d7373.
. Compliance with results reporting at ClinicalTrials.gov. N Engl J Med2015;372:1031-9. doi:10.1056/NEJMsa1409364. Commission Guideline — Guidance on Posting and Publication of Result-Related Information on Clinical Trials in Relation to the Implementation of Article 57(2) of Regulation (EC) No 726/2004 and Article 41(2) of Regulation (EC) No 1901/2006. Official J Eur Union2012;55:7-10. European Medicines Agency. EudraCT Home Page. 2016. https://eudract.ema.europa.eu/whatsnew.html (accessed 6 Apr 2017).
. OpenTrials: towards a collaborative open database of all available information on all clinical trials. Trials2016;17:164. doi:10.1186/s13063-016-1290-8.
. Does use of the CONSORT Statement impact the completeness of reporting of randomised controlled trials published in medical journals? A Cochrane review. Syst Rev2012;1:60. doi:10.1186/2046-4053-1-60.
. Reporting discrepancies between the ClinicalTrials.gov results database and peer-reviewed publications. Ann Intern Med2014;160:477-83. doi:10.7326/M13-0480.
. Timing and Completeness of Trial Results Posted at ClinicalTrials.gov and Published in Journals. PLoS Med2013;10:e1001566. doi:10.1371/journal.pmed.1001566.
. Rate of asthma trial outcomes reporting on ClinicalTrials.gov and in the published literature. J Allergy Clin Immunol2014;134:1443-6doi:10.1016/j.jaci.2014.09.019.
. Clinical trial registration, reporting, publication and FDAAA compliance: a cross-sectional analysis and ranking of new drugs approved by the FDA in 2012. BMJ Open2015;5:e009758. doi:10.1136/bmjopen-2015-009758.
. Publication and reporting of clinical trial results: cross sectional analysis across academic medical centers. BMJ2016;352:i637doi:10.1136/bmj.i637.
. Audit: how to do it in practice. BMJ2008;336:1241-5doi:10.1136/bmj.39527.628322.AD.